Another weekend, another hackathon! The Garage48 Tbilisi 2017 hackathon has ended and we are beyond amazed by the results the team delivered. We started on Friday, April 21, with 70 people, 22 ideas pitched, 17 teams formed and by Sunday 16 teams had survived the sweat and tears (and also a lot of fun)! We couldn’t have reached the results without the help of our amazing mentors Joao Rei (IDEA), Jordan Valdma (TransferWise), Archil Bakuradze (JSC MFO Crystal), Sandro Asatiani (GeoLab). Thank you on behalf of all the participants for helping make it happen! After hearing all of the pitches the jury consisting of Lasha Gurgenicze from TBC Bank, Joao Rei, Jordan Valdma, Archil Bakuradze and Kai Isand had a tough choice to make. Below are the winners they chose after a long and careful consideration. Child makes algorithm in the module and sends information to robot, which will behave himself according to algorithm. Book AR is the mobile app, where physics and chemistry experiments, mathematics equations, historical events and biological informations are visualized. Book AR - Visualizing Knowledge. We want to make lunch breaks more fun and adventurous. Instead of eating with the same colleagues every day, office workers could use that time to get to know people who are truly different from themselves. Our app shows people in the user's region who also feel like meeting a random stranger for lunch and connects them so that they can enrich each other's lives. Here’s also a shout out to each team who did amazing during this weekend and after 48 hours managed to deliver a great pitch! A mobile app that allows users to play a game of befriending trees in Tbilisi and keeping them safe. Our goal is to solve the main problems of all existing printers. We are going to increase printing spead, reduce waste of material and printing price. We want to give blind people access to all the information we have. Mostly we are getting information from books and articles online, but blind people can't use them so we are building ebook reader for blind people that will display any ebooks using Braille's letters. Our idea is about environment protection. We want to encourage people to throw trash in the appropriate place and after that, they will be gifted. If someone wants to live in a clean environment, this project is ideal for them. There were times when people did not know much. They used to hunt for information. Nowadays, people know too much. It’s just that what they know is not always true. In information age people have to hunt for real and fake news to know what is the truth. Quack Hunter is a modern version of Duck Hunter game challenging users to differentiate false and true information, collect points and master their quack hunting skills. Hamilton, a web app that helps you protect your money in stock investments and gives you suggestions about stocks that will be successful in the future. Basically app helps people to earn a lot of money and protects them from lying brokers. We are going to make a Hologram Guide/assistant. There is a already something like that, for example in Estonia, but we are changing the contest to make the most benefit from it. For example, hologram guide in museum, not to mention that it will entertain and educate people, it will make museums more popular. It will make important change in culture. Hate him? - Shake him! Entertaining game "Shake the dictator." The player chooses which dictator he wants to shake and where. LI-FI transmitted data through illumination by sending data through a LED light bulb,Visual light communication is the future. We can send data faster than wi-fi, we can use it in places where we cant use radio waves, like an airplane or nuclear power plant. Our infrastructure can be implemented anywhere where there is a light source. A social-network and a database for upcoming and established artists to meet each other, team -up and find projects to participate. Converting and syncing standart songs into "led motional" songs. Wifive - marketing service software, which uses wifi cell to communicate with customers; to gather statistical information, to improve customer service delivery; to spread advertise and to share information/documents easily during the events/meetings and ect. To summarize, we are exchange information for high speed of internet. Our greatest gratitude goes to our partners and co-organizers Keti and Elene from Impact Hub! Thank you for hosting us and helping create this magical hackathon! 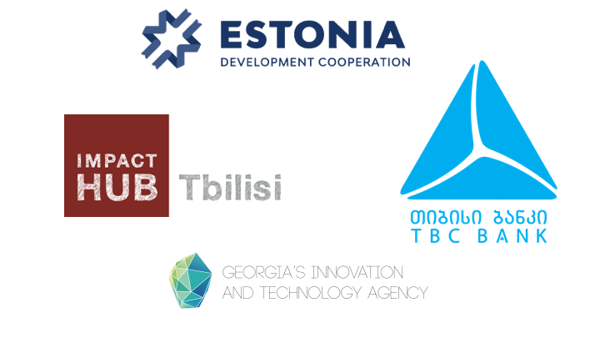 And last but not least, we say a big THANK YOU to our sponsors and partners from Estonian Development Cooperation, TBC Bank and Georgia's Innovation and Technology Agency who made this event possible! YOU ROCK! This event was organized by Garage48 with the financial support of Estonian Ministry of Foreign Affairs under the Fund for Development and Humanitarian Aid.